Sunshine Empire episode contains lessons on how to spot a scam. Sunshine is not the first Ponzi-like scheme and will probably not be the last. 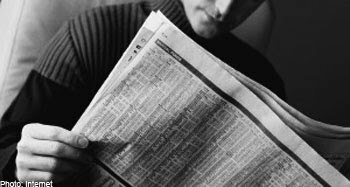 There was the Gemini Chit Fund in the early 1970s. In a Ponzi scheme, people are enticed to investing by promises of high returns. However, the returns are paid out of funds from new investors entering the scheme. All will go well until the flow of new funds dries up. Warning bells should ring if you are asked to invest money and rope in others with you. Only professional trained people can provide financial products and services and you will enjoy the protection of MAS laws if you deal with a regulated entity. MAS provide a Investor Alert list which details the entities it has not authorized to conduct regulated activities here. What are the returns dependent on? Is the return being paid from new inflows of money or from actual investments? When will the returns be paid? What is the amount and how much is guaranteed? Who provides the guarantee? How long must you stay invested? If you want to withdraw your money prematurely, what are the penalties and procedures? How can you monitor the performance of the investment? What reports will you receive and how often? 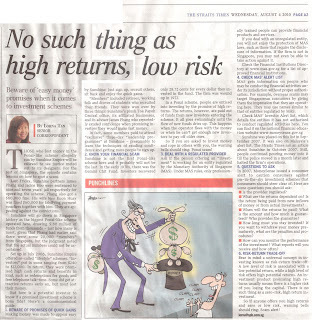 There is a universal concept in investment known as risk-return trade-off: Low risk level is associated with a low potential return, while a high risk level offer potential higher returns. 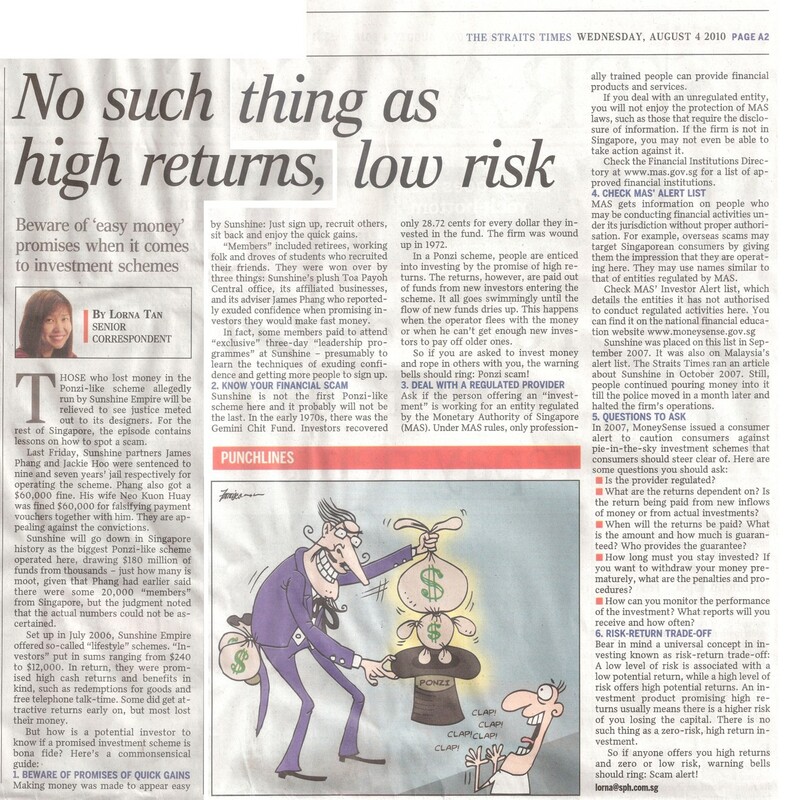 High returns investment product means there is a higher risk of losing the capital. There is no free lunch in the world, thus there is no such thing as a zero-risk, high return investment. First time home buyers in a rush to secure a home may inadvertently commit themselves to properties beyond their means. 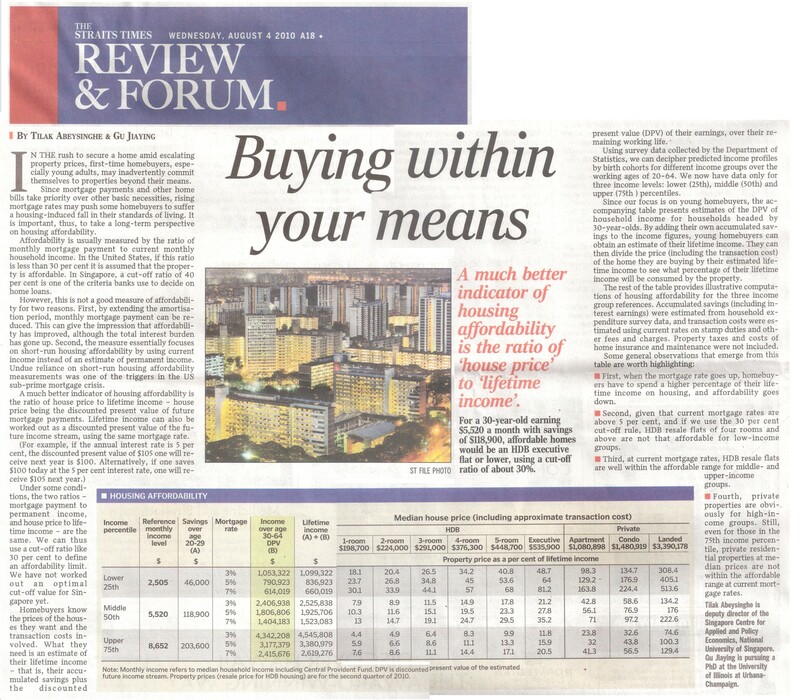 It is important to take a long-term perspective on housing affordability since mortgage payments take priority over other basic necessities. In Singapore, affordability is measured by the ratio of monthly mortgage payment to current monthly household income with a cut-off ratio of 40% by banks to decide on home loans. However, this might not be a good measure of affordability. Ratio of house to lifetime income can be a better indicator of housing affordability. Homebuyers need an estimate of their lifetime income after they know the prices of the houses they want and the transaction costs. The table provides illustrative computations of housing affordability for three income group references by focusing on young homebuyers. You may not know if you need travel insurance or not even though you are planning for your vacation. You may have come to know about the necessity of travel insurance from travel agents. Hotel reservations, airfares and additional arrangement cost a bomb so question arises whether to make insurance or not. You might request for money back because of various incidents. Travel tours might be cancelled due to number of incidents. Travel insurance ensures that your money will be refunded if airline unexpectedly go out of business one week prior to your trip or you are not able to travel and vacation deals are off due to illness. Travel insurance can help in one way or another. Travel insurance will take care of unforeseen circumstance that may prohibit you from flying. In the event of sickness to a death in the family, your money will be refunded. Travel insurance is an essential part of any trip and is something that should not be put aside. Travel insurance protects you while traveling, thus providing the necessary protection you will need in the event of a unfortunate event. Any person traveling anywhere without travel insurance will be in a dangerous situation if an accident occur. Medical cost, transportation to a medical facility, and reimbursement for certain or some nonrefundable costs due to a interrupted trip, and financial loss of funds are coverage which travel insurance provide. In the event of illness or serious injury, medical transportation to an appropriate medical facility and medical treatment will be covered. There will be coverage to bring you back home if it is deem necessary. The families of four of the victims killed in Monday's bloody hostage crisis in Manila will receive compensation totaling up to HK$1,320,000 (US$170,000) for each victim. The sum comprises a HK$300,000 payout from the insurer of the Hong Kong-organised tour they had been travelling on, a HK$20,000 gratuity from the Hong Kong government, as well as an extra HK$1 million because the four had bought travel insurance from Chartis through the travel agency, Hong Thai, for the tour. The next of kin of the other four dead victims will receive up to HK$320,000 for each victim. Chartis Vice President, Mr Wong Fu-tat, said at a press conference that as the incident was a special case, "the level of compensation for victims has been doubled from HK$500,000 to HK$1 million, under insurance covering accidents caused by public transport". The insurer will also help with the cost of bringing the remains of the dead to Hong Kong. Mr Wong adds that the injured stand to receive up to HK$1 million in medical insurance benefits. Chartis will also provide them with cover of up to HK$100,000 for six months of follow-up medical treatment in Hong Kong. Separately, the Manila Bulletin newspaper reports that the victims of the hostage-taking crisis will receive insurance benefits from the Passenger Accident Management and Insurance (PAMI) Agency as the bus that carried the tourists is insured by the agency. Land Transportation Franchising and Regulatory Board (LTFRB) officer-in-charge Assistant Secretary, Dante Lantin, said: "The families of the dead victims of the hostage are entitled to at least PHP60,000 (US$1,318) insurance claims each. As for the injured passengers, PAMI has committed to shoulder part of their hospital expenses," he said. Apart from the eight Hong Kong tourists killed, the hostage-taker himself, former police officer Rolando Mendoza, was shot dead. At least seven others were injured in the incident. Average life expectancy of people has been extended due to medical breakthroughs and advancement in technology. Seventy years old is no longer considered to be old age by today’s standard. But there is an increasing chance of us requiring some kind of professional care or assistance in our lifetime. Elderly people have three most important concerns (1) having enough money for daily living and not outliving their assets; (2) maintaining their health; (3) the ability to remain independent in their home. 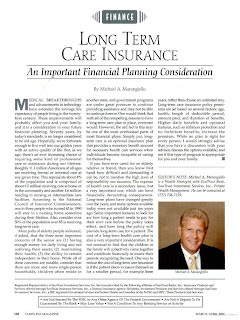 People often overlook long-term care as part of their financial plans. Long-term care provides a monetary benefit for necessary health care services when individuals become incapable of caring for themselves. Caring for an elderly is difficult and demanding as it requires a high level of responsibility. The secondary issue will be expense of health care which can have financially devastating consequences. Sole breadwinner’s last pay cheque of $300 was the only source of income that keeps the family of six going. Now the window has to worry about where the next meal for her and her children will come from without her husband around. To make things worse, two of the children are ill; one was diagnosed with kidney failure four years ago, another has been seeking treatment for depression at IMH. You can by no means be familiar with when you might breathe your last. Family will be blown apart all of a sudden with unforeseen happening. Having protection will assist you to look after your family even after you are no longer around. A life insurance can be used as a protector of your loved ones once you are no longer there to do it personally. You will be providing financial protection to your family as well as securing their future on the whole. Some may not be familiar that life insurance not just protect you, it protect your entire family as well. It is weird that a lot of people are just not familiar with the advantage provided by life insurance. That is why they desist from buying them. The idea behind all life insurance policies like whole life or term life insurance is to grant you with financial help in case of tragedies. There are infinite and several advantage of life insurance like financial security to your family in case you are no longer with them, protecting the future of your children by providing them with financial help to keep on with their studies. Ensuring your family is taken care of after you are gone is a very important thing to think about. It is very depressing to ponder over this issue but it is essential to ensure your family has enough financial support when the time has come for you to go. Especially if your family members are financially dependent on you and your salary. If you have already invested in life insurance, take a look at your policy and see if it’s the right one to have. For all the above reason, don’t waste your time, act fast and buy a life insurance to protect the financial future of your family right now. Don’t buy life insurance because someone tells you to or because that is what the rest of the world is doing. Buy it because you want to take care of your family today, you will be able to take care of them even when you are gone. Thai Insurance Commercial - "Grandpa"
All of us are given an opportunity to manage our own time and resources. Every day, we are given 86,400 seconds - to invest or to spend. The choice is yours. If you have invested your time well, you will find that you have created enough wealth. Creating wealth is easy if you have invested your time, energy and money in the right places for the right purposes. These three shocks are inevitable in most individuals' life, it is just a matter of when and the sequence. However, if every individual handles them well, I would say your financial health status should be in pink, as your strategy should ensure retirement goes as planned even if the three shocks all occur at the same time. Financial planning creates a well-planned and well-organised time line that can withstand three major shocks. To avoid the risks above, you should establish a proper Risk Management Portfolio (RMP) to manage your risk exposure efficiently and effectively. What is an RMP? An RMP is a combination of a portfolio of risk management programmes to manage the different aspects, levels and degree of impact of the risks that you are exposed to everyday. Insisting that you be given a thorough financial health check before any insurance plan be recommended or purchased. Insisting that you be given a comprehensive selection of the insurance plans from different companies to compare and choose from so that you can have the best option in terms of coverage and premium costing. Insisting that you be given a complete report on how your overall risk management portfolio is able to withstand the time-line Shock, Self-funding Shock as well as the Market Shock. This situation arises when income comes to a stop and money is required to handle daily expenses until income start to stream in again. This is one of the most overlooked aspects in risk management. A classic example can be found in the way most people manage their medical risks. The cost of medical insurance plan increases every three to five years, depending on the medical plan. If you are struck with a critical illness like cancer or heart attack, most probably you will be out of work for some time, and maybe even a long time. When that happens, it will create a great challenge - who is going to pay the premium for the medical insurance plan which is increasing every three to five years? The premium can reach an unaffordable level after a few rounds of adjustment so unless a funding mechanism is structured within the overall Risk Management Portfolio, your savings or cash reserve will be wiped out rather quickly. Therefore, it is important to ensure that your overall Risk Management Portfolio is able to withstand the self-funding shock and at the same time, provide you and your family with lifetime financial security. When the market does not go in your favour or major events cause disruption to the usual performance of the market. A risk management portfolio without any element of protecting you against market shock can only be as good as temporary protection. We have seen so many cases in which the risk management portfolio was wiped out completely due to the inability to keep the program going in the midst of an economic or market crisis. Market shock can only be managed through proper strategic planning. Understanding how inflation, economic data, interest rate and liquidity can impact the market is vital to the successful management of your money. Depending on your risk profile, your funds can be invested into tactical growth, balanced and income funds. The percentage of allocation into each of these investment categories will depend on your risk appetite, investment objectives, time horizon, how much capital you wish to accumulated and the portfolio returns needed to achieve your investment objectives. Your objective here is to construct an investment portfolio that can withstand market shocks and also give you a decent rate of return of between 8 per cent to 12 per cent annually. One of the keys towards achieving lifetime success is to engage ourselves in financial education. Financial education is more than just acquiring information and knowledge. Financial education is more than just knowing the facts. The love for children is so much that parents are willing to do everything for them. Right? There wouldn’t be any parent who does not think for the future of their children. When one enters a married life, he is already thinking of having a baby. As early as conception, parents are already preparing for the future of their baby. Education of the child is the very first thing parents would think of when the baby is born to the family aside from bringing him/her up. That is why couple would plan for the education of their child as early as they can. This is to prevent the child from being deprived of his right for education in case something happen to the parents. Education insurance can help the child to pursue his education with or without his parents later if he has been insured of his education through education insurance. Education insurance can be purchased anytime for a child, even before the child is born. It is beneficial to purchase during this period because the premium is lesser compared to when the child is already there. At the moment you buy education insurance for your child, you should already decide which school your child will study. If you plan to send your child overseas to an exclusive school, you know that you will need to prepare a huge amount later. So it is better to have a plan for his education as early as zero age. The premium of the education insurance depends upon on the kind of school your child will enter in university. Alongside with the education insurance are benefits for the payer. Insurance companies offer in case of untimely or premature death of the payer, the insurance is considered paid. This means that the child’s tertiary education is already assured even without his parents. The child will enjoy the benefits of the education insurance that his parents brought for him. If you are a parent who wishes to offer a bright future for your child, get education insurance for him now. Some parents have purchased permanent life insurance policies on children so that they can use the cash value accumulation later in life. Permanent life insurance should be considered on a child once the parents have taken care of their own life insurance needs. The added benefit is teaching child about life insurance. Parents that show their children the benefits of life insurance prepare the child to take responsibility for their own financial future. You may ask is it wise to buy an insurance policy for your child? Is it really necessary? Parents often ponder over these questions. It is wise actually buying a policy of child life insurance as it leads your child’s life to a future which is financially secured. As they step into adulthood, the child life insurance policy will have cash value that supports your child’s life with a financial cushion. Child life insurance policies are affordable as any adult life insurance policies. Some might consider this as a foolish decision to spend money on any child life insurance policy. 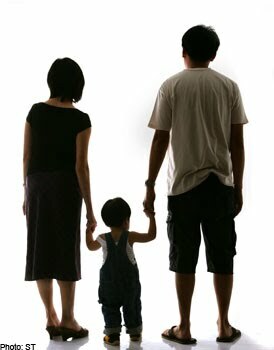 But the following are reasons why it is important to beneficial to have a child life insurance policy. In case your child suffers from illness that may take his/her life, you may be left with funeral and burial cost or may be even medical bills. 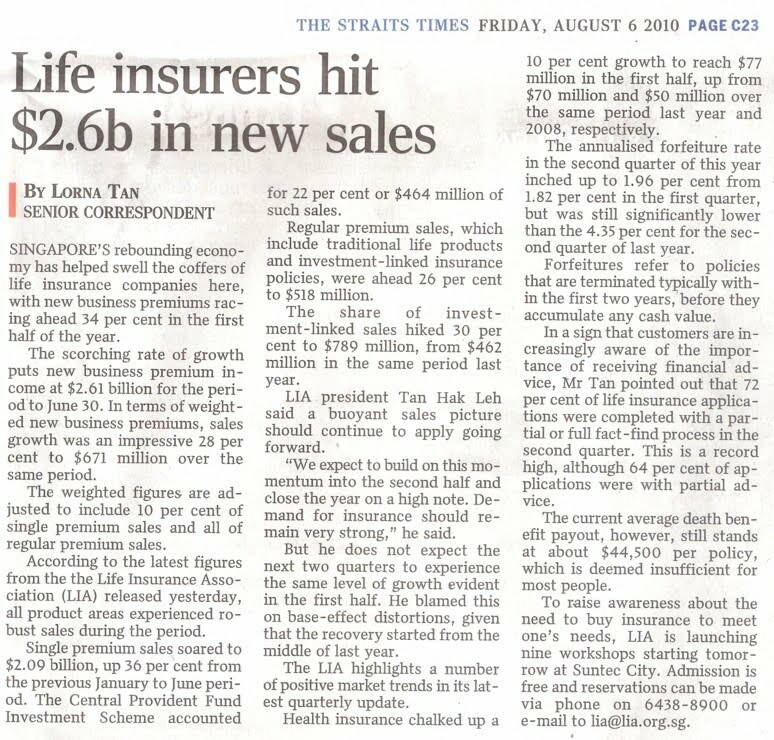 So the pre existing life insurance proceeds could provide the extra cash you need to settle the worries. In case of fatal illness, you may have to bear huge medical expenses. So the child life insurance policy’s proceeds can support the family with significant financial relief. If your child develops any serious medical condition while he/she is uninsured, parents may find premiums to be expensive. However, early coverage results in significant cost-savings. It is agreeable that the child hardly show any significant contribution to family’s income, but purchasing some insurance policy for children can really give good financial support under certain events. Labels: Children's University Education, Why Insurance? 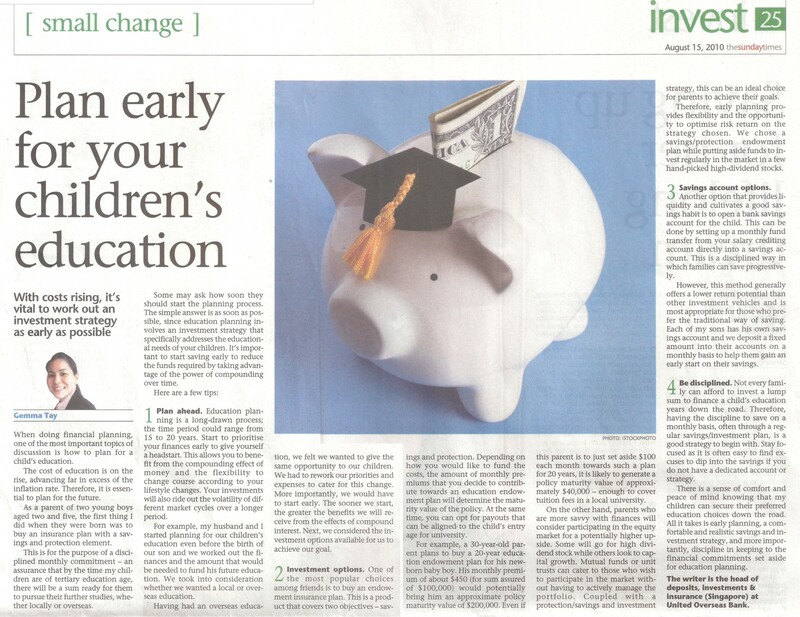 Child’s education is one of the most important topic when it comes to financial planning. It is essential to plan for the future because cost of education is advancing faster than inflation. Education planning is a long process as it could range from 15 to 20 years. There is a need to start the planning process as soon as you can to reduce the monthly commitment required by taking advantage of power of compounding over time and the ability to ride out the volatility of different market cycles over a longer period. Endowment insurance plan is one of the most popular choices as it provides both savings and protection. However, parents who are savvier with finances can consider equity market, high dividend stock, mutual funds or unit trust. Early planning brings flexibility and the opportunity to optimize risk return on the strategy chosen. People who prefer the traditional way of saving can open a bank savings account for the child to provide liquidity and cultivate a good savings habit. Not every family can afford to set aside a lump sum to finance a child’s education. Thus, it is a good strategy to have the discipline to set aside money on a monthly basis through either a regular savings/investment plan. It is very easy to find excuses to dig into savings if there isn’t a strategy or specific account setup, so stay focus. 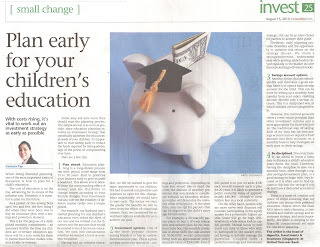 There will be sense of comfort and peace of mind if children education fees are secured by starting early to plan with a saving and investment strategy. Discipline will be the key to success of education planning. New business premiums are 34% ahead in the first half of 2010. There are several possible reason for this scorching rate of growth. People are using life insurance to provide their families with more than just money for final expenses and limited replacement income if something should happen to them. They may be interested in providing enough money to fund a life annuity to support their spouses, as well as enough money to provide for their children until they can support themselves. If they want to provide university money for their children, additional insurance may also be needed. Dual-in-income families often depend on both incomes for necessities, and must protect themselves against potential loss of this income if one spouse should die. This means both spouses need to purchase insurance. More people are buying increasingly larger policies to maintain a standard of living for their families rather than just provide for necessities. Part of this may be because consumer goods and services that were previously considered luxuries are now considered necessities (air-conditioning, personal computers, higher education, etc.) Also purchases of larger policies will likely be part of formal financial planning as people suddenly realize how much insurance they actually need to protect their families against the possibility of their untimely death. Financial planning itself will become more commonplace and will no longer be a planning tool only for the affluent. Where Are You? And Where Do You Want to Go Today? Ever heard of the phrase, “You can’t get there from here?” You also can’t get to the next level of success until you know where you are today. Ever heard of the phrase, “If you do what you’ve always done, you will get what you’ve always gotten?” If you’ve never taken an hour to think about where you want to go with your finance, how will you know where to go? Do you want to be doing better than you are right now financially? How will you achieve that? And will your course of action be anything new? The point of all these questions is that it’s nice to have a helping hand when you start to define where you are and where you’re going. This is what this blog is all about, block out a time slot today and arrange a appointment with a professional to give you a helping hand. Take a little time out for some introspection and reflection on where you are and where you want to go; otherwise, you can’t get there from here! 1. Define your financial goals. What do you want to have in the future? Write down your goals and a general timetable so you can remind yourself of your goals later on. Some good goals are: having a car in three years' time, enrolling in graduate school in five years' time, establishing an emergency fund within a year. By having a timetable, your goals become more realistic and attainable. 2. Look for a job that will use your skills, give you room for growth, and will give you steady income enough to meet your needs and allow you to save. 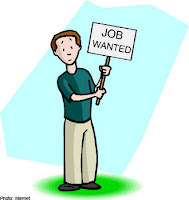 The job market is very competitive but that does not mean that you should grab the first job opportunity that comes by. Weigh the pros and cons of each job offer and choose wisely. If the job offer comes with additional benefits such as car plan, subsidy for further studies, and profit-sharing, that's even better. 3. Once you have a firm job offer, draft a budget to help you plan your monthly spending. 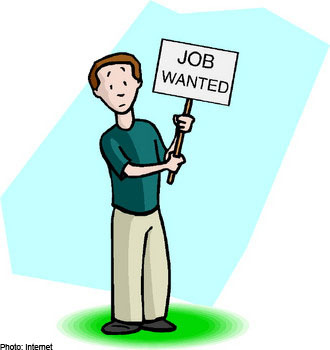 With a new job, you will have a steady income coming in. Start by saving first (see next item below), then allot amounts for regular expenses such as food, transportation, clothing, and others. Live within your means. 4. 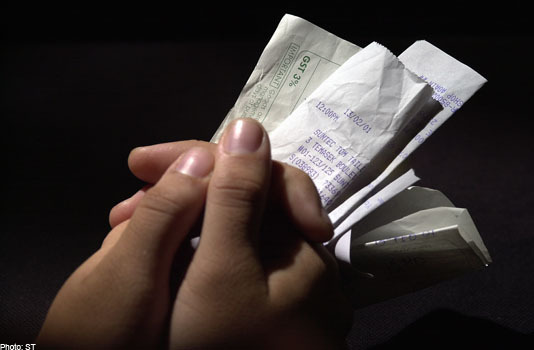 Open a separate bank account for savings, different from your payroll account. This will be for your savings. Ideally, you should deposit money here regularly and make the money grow for future consumption. Ideally, too, you should take out the money meant for your savings (at least 10 percent of your income) as soon as you get your pay, so you won't be tempted to spend all of your income. 5. Save up for an emergency fund. Make this your priority for saving. Build up a fund equal to three to six months' worth of your expenses so that if anything happens-you lose your job or get sick-you can have a fund to dip into to help you in your day-to-day expenses. Don't touch this fund unless there's an emergency (thus the name). You can put this fund in a time deposit or money market account for easy access. 6. 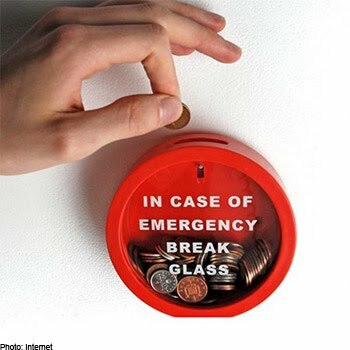 Once you have saved up enough money for an emergency fund, tackle your other savings goals. Save for that car or dream home in the future. 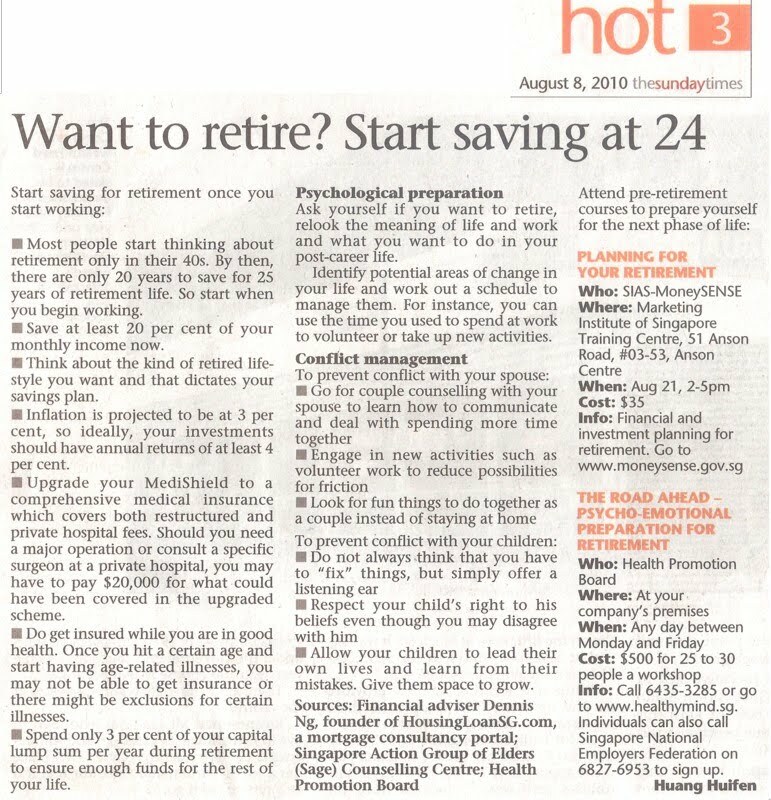 Don't forget to start saving for a retirement fund because the earlier you do it, the better as compound interest will make your money earn even more without you doing anything. To give your savings a kick (in terms of growth), look into investing them in instruments or accounts that may give you more interest or yield than what a savings account may offer. Talk to your bank for more details. 7. Get insurance coverage. You'll never know what's going to happen, but it pays to be prepared always. Take out a life insurance policy if you have dependents. Buying life insurance while you are young also means paying for lower premiums. If your company does not give free health insurance, make sure you get one for yourself. With health care costs escalating and more so as you get older, it will do you good to have some form of coverage in place. 8. Read up on financial matters. Sharpen your financial IQ by reading more about personal finance and attending personal finance seminars. You can learn from experts to help you stay on the right track financially. Good luck and we hope all your financial dreams come true. 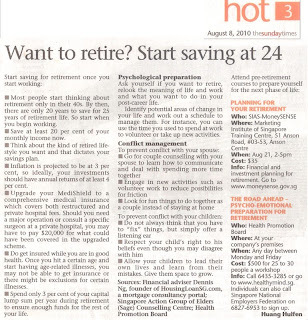 If you only think about retirement when you are in your 40s, there is only 20 years to save for 25 years of retirement life. You should start when you begin to work, saving at least 20% of your monthly income. Your savings plan will be determined by what kind of retirement lifestyle do you want. There will be a need to upgrade your Medishield to a comprehensive medical insurance to prevent yourself from paying $20,000 or more for major operation which will be covered in the upgraded scheme. You will not be able to purchase insurance or there will be exclusions when you hit a certain age and start developing age-related illness. So do get yourself insured when you are young and healthy. AS day follows night and is little under our control, so do our lives move through the years. On this journey, our physical, social and family needs continue to evolve as the years go by. We're the children of our parents. We're the parents of our children. Sometimes, we may become the support system of our parents. And finally, our children often become the support system for us, especially for most Malaysians. Accompanying each and every stage and change in life, we face different challenges of money management. Whether you're young and single, newly married, or starting a family, find out your financial needs and objectives are, as well as the financial risks and mistakes you need to avoid at every stage. The young and single group includes those who have not married or teamed up with a partner. The key to money management at this stage of life is to set financial goals and use your money wisely. Since you're just starting to earn an income, your spending profile can seriously affect your savings and investing habit for the rest of your life. 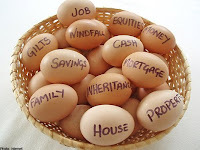 But since most earn a relatively fixed income, we should be able to plan our living expenses reasonably. The key money management strategy here is to adopt a relatively conservative lifestyle that is within your means. Start building your wealth as early as possible. This group is those who recently got married. The challenge of money management at this stage is to establish a financial plan together as a couple and compound the synergy effectively. This stage of financial life is typically characterised by two people with different upbringing and value systems joining together. Developing a financial plan together may not necessary mean that you should merge all of your assets into one plan. The key is to have a master plan that takes into account the holistic view of the family and still allows for two different investment styles and risk tolerance. For some couples, financial matters can be a sensitive topic. If this is the case for you, consider getting a financial coach to act as facilitator. This group includes married couples with one or more children. The key focus at this stage is to take your children into money management consideration. There's often an adjustment period due to the increased responsibilities and family commitments. Despite the importance of your children, you must not neglect saving and investing for old age. The writer is managing director of Whitman Independent Advisors Sdn Bhd and author of five best-selling personal finance books. WASHINGTON - Retirement is full of risks. There's the risk of sickness and needing expensive care, or of running out of money or of being divorced or widowed. The problem with many retirement plans is that they try to treat all of these risks with a single solution -- save more money or buy an annuity. "There are multiple risks in retirement, and it's wise to insure against each of them, to the extent insurance vehicles are available and affordable," says Frank Todisco of the American Academy of Actuaries. Here are some of the risks that can occur in retirement and some ways to insure against them. -- You may not have enough money to afford your lifestyle. This is the first risk everyone talks about. The best way to prepare for it is to save. You can also protect yourself against this risk by delaying retirement and the start date of your Social Security benefits. Cultivate the skills and contacts that could net you part-time income after retirement. Do the lifestyle analysis necessary so that you know how much of your current way of living you could give up. Sometimes the only 'insurance' you need is the flexibility to know you could downsize and still enjoy life. 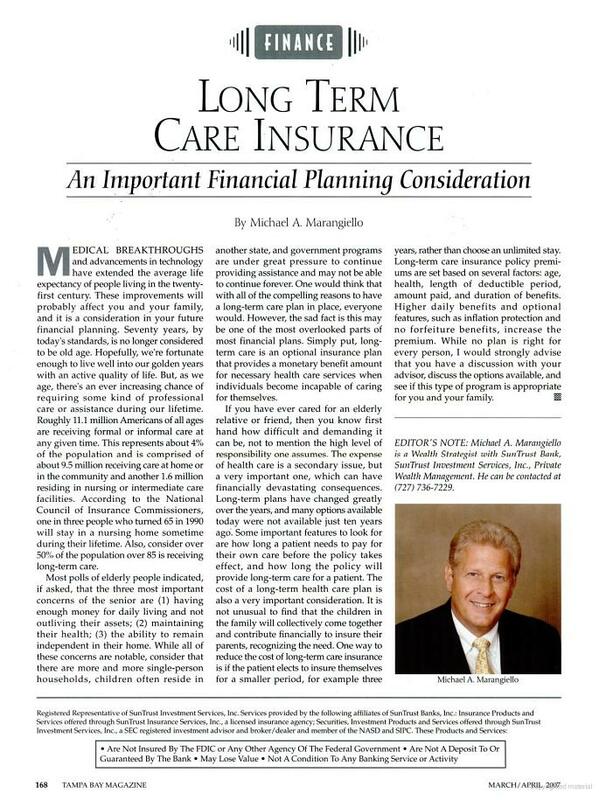 -- To address the need for extensive healthcare there is long-term care insurance. Policies have improved from their early days, and premiums now are tax deductible. But shop carefully. Some policies cover only nursing home costs. Others also cover care at assisted living facilities and at home. Most policies require you to have some physical or cognitive problem that makes it necessary for you to get help with the activities of daily living. Policies also have different rules about how long they will pay, how much they will pay, and whether their benefits will rise with inflation. -- Long-term care insurance will not pay your rent every month if you live to be 98 and are still healthy and somewhat self-sufficient. To insure that you'll not run out of money over a long, long life, many advisers are starting to recommend a product called "longevity insurance." It's really a deferred annuity that you defer for a very long time. In an example provided by bankrate.com, you might buy it for a one-time payment of $25,000 when you are 65, and it won't start paying until you're 85. At that time it would pay $3,000 every month for the rest of your life. A product like that might be competitively priced enough to take a chance on, if good genes run in your family. If you invested $25,000, earned an 8 percent return every year, and then took out $3,000 every month, you'd be out of money in fewer than four years. Another approach is to buy several immediate annuities at different times in your retirement, a strategy called an "annuity ladder" that is recommended by Virginia financial advisor Bob Carlson, editor of Retirement Watch newsletter (www.retirementwatch.com). When you buy an immediate annuity, you turn over a flat sum to an insurance company which promises to pay you monthly for the rest of your life. Most advisers recommend that retirees only annuitize a portion of their savings anyway. He takes it a step further by suggesting retirees phase in their annuity purchases over several years. That would protect them from the possibility of losing out: buying a big annuity and dying before receiving many payments. It would also help you to bump up the monthly amounts you receive from those annuities. They would be larger in the future both because they'd be calculated on your (presumably shorter) life span, and because they would be calculated on the basis of bond yields that might be expected to rise from today's comparably low rates. Most families don’t have enough disability life insurance. If you are one of those families, chances are you don’t have it because it is too expensive. Sometimes you don’t have the time to apply for one. You keep putting it off to tomorrow. Well, if you find the right insurance company to provide you with what you need, you will have your disability life insurance in no time. You will have the insurance protection that you and your family deserve. Have you ever thought of this happening? What if your last payday was your actual last payday? What will you do for money? How would you pay daily expenses like electricity, mortgage, food, car, and other expenses if there is not money coming in? If you don’t have a paycheck for the next 3 months, can you see yourself surviving? 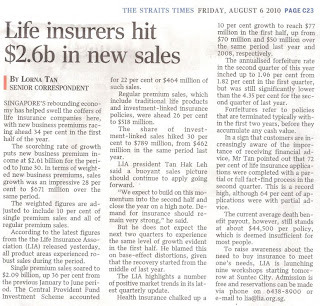 A number of Singaporeans know the need for health insurance, life insurance, car insurance, and home insurance. Nonetheless, they still think about insuring their ability when it comes to their work. They understand that it is very important to acknowledge the fact that they should have insurance on their income or what is also known as disability life insurance, just in case they get to the point when they can no longer work for a period of time. Here’s an example of disability life insurance. Imagine that there is a person who is earning $3000/mth. If he works for 30 years, he will have $1.08 million. This does not include the annual bonuses as well as pay increment. It is only practical that the individual files for some kind of disability life insurance. The thought of becoming disabled may not enter a person’s thoughts but there is a possibility of that happening so it pays to be prepared when it does happen. With disability life insurance, one can keep a steady income from flowing in. Although disability life insurance covers us and our loved ones during good and bad times, it can be a very dry subject. Following is a quick list to make understanding disability life insurance easier. Buy only what you need: Make sure you have enough coverage if you ever have to make a claim. And be sure to keep policies up to date with any salary increases you get. Compare Apples with Apples: When comparing disability life insurance policies, be careful as they have different definitions of disability for each illness. Make sure you specify the same amount of coverage for both so you can make a level comparison. Financial planning is necessary to make sure you have enough life insurance and disability life insurance to protect your income. It may not be a topic that everyone finds interesting, but if an emergency arises, you will be glad you took the time to get some good disability life insurance.